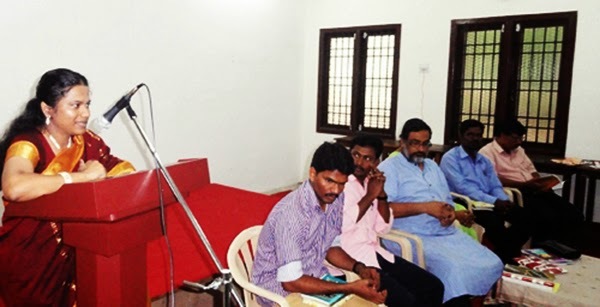 Click here to Write your Reviews about Pramila's Works. 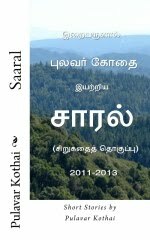 Review by Prof. Dr. David Prabakar of Madras Christian College of Aham Nooru, a Sangam Tamil work by Ann AriEl (Pramila), can be found here. 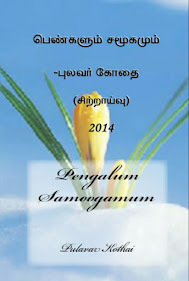 Click here to read the review of the Tamil novel, "Antha Iruvarin Naatkurippugal" by "Prof. David Prabakar." Literature must be in a way that people take something from it for their life after reading a piece of art work. Antha Iruvarin Naatkurippugal does this pretty well emphasizing about the importance of good families to make a good society and emphasizes that marriages must be made of true love to achieve the goal of a good society. The selection of the title is a catchy one; for, everyone would be curious about the contents of a diary, but the book is not a revelation of two people's diaries as the title might suggest. It is a work of love showing the successful union of three lovers, which is a happy ending, that is not a reality these days, but society has to learn from this. The author's depiction of forced marriages in the introduction as, "Forced marriages are vain as it is like trying to dissolve salt in oil." is apt for the subject. It is appreciable about the portrayal of the feelings of love for a man that springs in a woman's heart, which generally lacks in our literary works. I appreciate the author for portraying such feelings in a beautiful way. The frequent usage of certain common English terms by the female characters in the novel is not a made up one as that is a reality these days. The characters are never angry or disturbed as all of them belong to an upper class society where such things are not much necessary with most aspects of life. Caste differences doesn't matter for the characters as they are of a well-to-do lifestyle. The book gives minute details of a high class life all over. 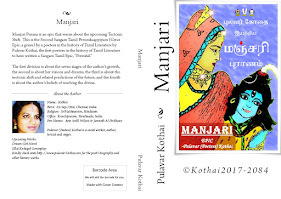 I wish the author depicts the differences in the society that remains a hurdle for love marriages in Tamil Nadu in her future works. The novel shows how unnecessary deaths occur due to the refusal of love marriages as well as the result of forced marriages, which is a painful reality. The state of the corporate world portrayed in which most of the populace are out of touch of what is happening around them is a reality. The book has english in most of the places where the language is unavoidable, which is not a mistake, but its much appreciated for the author's efforts to add translations to the respective english passages. The truth that lovers prefer the beauty of the usage of the mother tongue to express their feelings of love is touching. The scenes where Shivani is scared of caterpillars, cockroaches, etc shows women a bit weak, which is rare in reality. I wish the author shows stronger sides of women in her future works. The husband's help of dicing onions is appreciative but there are so many things more for chivalry. The passage where a father says, "You look at her as a child, but its me who is troubled about her safety like having fire tied around my belly. She is accursed with beauty..." portrays the state of beautiful womanhood's vulnerability and insecurity in the society. Beauty is depicted as a must-have to be loved, but I think this is not true with everyone in reality. I wish the author portrays the love and problems of the middle class and their hurdles in achieving a good marriage in her future works. I conclude that the novel is an adorable piece of art as well as a portrait of the carefree lifestyle of the upper classes as well as a model for everyone to follow to make a united happy society. "The Pearl Box and the Seahorse" is is a sweet little tale. It's nice someone is writing a genuinely heart-warming story, as sometimes, that is exactly what children need." “The Pearl Box and the Seahorse”, by Ann Wilson is a precious gem of a fairytale that would spark joy, imagination, and warmth in anyone’s heart. This story of mystery, magic, hope and success directs the reader into recalling the happier times of childhood when dreams really did seem to come true. “The Pearl Box and the Seahorse”, is not just written for children and young adults, but for the Prince and Princess in all of us. The story begins with the heroine, Rosemary, who is the daughter of a wealthy English man, recently remarried. You can imagine Rosemary’s sense of sadness for no longer being the center of attention in her Father’s life. This is a shared experience for all children as they grow to learn they can’t remain babied forever, and they feel a tinge of isolation for the first time. It can happen with a remarriage, when other siblings come along, or as just part of growing up. The reader instantly relates to Rosemary as she experiences this sadness. But there’s hope! Good fortune meets destiny when Rosemary discovers the Pearl Box. This beautiful found object is a doorway to endless joy and happiness. Let the fairytale begin! Rosemary is given a mission that takes courage and strength. She is no longer a child that needs being cared for. She needs to make her own decisions and stay brave in an unknown world. She now has others to think of. The magic in the world around her has communicated that she is the one to save Frideswide; the Island of Peace. She does not have to do this alone. With the help of her family, loved ones, and the beautiful white horse, she succeeds in banishing evil – The Witch of the Dark Woods. This delightful story and illustrations continue with the best ending anyone could wish for. When the author, Ms. Wilson, personally says to her readers, “I hope that the Island of Peace will inspire children to create a peaceful future on Planet Earth”, she is leading the way for that very dream to come true. “The Pearl Box and the Seahorse” inspires all of us to do good deeds, stay courageous, and keep an eye on the promise of a better tomorrow. I look forward to reading the sequels and sharing these stories with my grandchildren. If I have to sum up this novella in one word it would be “Beautiful.” The art of creating a fantasy world that children can relate to and hold their attention is not an easy one, and Ann has done it well. It has a theme of love and gentleness that overcomes evil, also something that children relate well to. The anticipation about what will happen next keeps the pages turning, and the love of Rosemary and Ferdinand will especially excite little girls, perhaps more than little boys. "Ann has written and illustrated a sweet, imaginative little book The Pearl Box and the Seahorse. Written as a children's tale or escapist fantasy for adults, it stresses the importance of peace and unity among all creatures. Innocence, beauty, and good intentions are needed now. We can, at least, be thankful they exist."